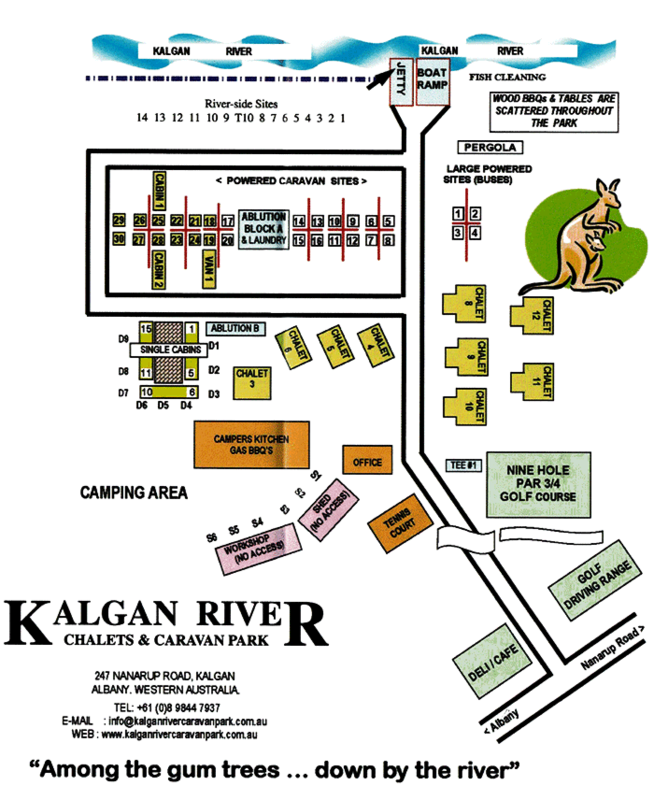 Kalgan River Chalets & Caravan Park offers you a wide range of accommodation options to suit all of your comfort and budget requirements. 9 clean fully self contained chalets to accommodate 2-12 people. Comprising 1,2 or 3 bedrooms. Kitchen/dinning room with cooking utensils, crockery, cutlery, refrigerator, microwave, electric kettle, toaster etc. Large caravan bays, with individual power, light, water and sullage. Well spaced with clean ablution block in centre. Sites have lawn and shade trees, BBQ's and table and chairs. To ensure everyone enjoys their stay in safety and comfort and that park facilities are respected please take the time to read our park rules. Speed Limit is Strictly Walking Pace in the park area and 25 km /h on the entrance road. Strictly one vehicle per site. Patrons please ensure all visitors' cars are parked in the visitor's car park. Caravan Tow Bars must face roadway (fire regulations). Sites must be kept clean and tidy. Chalets are to be kept in a good clean manner and on checkout all rubbish must be removed. Campfires are permitted in enclosed fire pits only but may be subject to fire brigade restrictions. Wood can be purchased at office. Fire Hoses are not to be used for any other purpose. Rubbish must be bagged and placed in bins. No fish guts please! Taking of under-sized fish will result in eviction from the park. No fish to be cleaned on site; please use fish cleaning facilities at boat ramp. Visitors must report to the office and pay appropriate fees. Evening visitors must vacate park by 10pm latest. Park facilities ablution block, tennis court, golf course, etc are complementary to park patrons only. All visitors must pay. To protect our lawn please use roads, avoid driving on grassed areas. Do not drive around speed humps. The washing of cars, caravans and boats may be done by prior arrangement in compound. Dump point located in laundry; do not use ablutions for dumping cassettes or toilet buckets. Children are to be under adult supervision at all times. Under seven must be supervised in ablution blocks. Must ride bicycles at walking pace and keep away from units and ablution blocks. Bicycles, skates, blades, scooters and skate boards are NOT to be used after dark. Ball games are NOT to be played on roadways; parents are responsible for any damage caused. Playground equipment is used at own risk. Children under 14 years old must be accompanied by an adult on the golf course. Mail and messages are held at the office. Urgent messages will be delivered. Noise must be limited between 10pm and 7am. Failure to comply with this will result in eviction from the park.